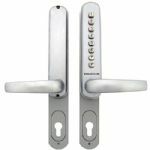 The Borg Locks BL6100 digital lock incorporates an extension plate fitted behind the keypad and inside handle making it suitable for use with 70, 72, 90, and 92mm centred multipoint locks and covers any existing holes in the door. It has a single column of 8 buttons which allows you to use the same button twice in your code for greater access control. 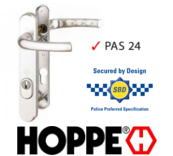 With a body width of only 45mm the BL6100 is perfect for fitting to narrow stile door sections. The free turning handle is permanently clutched so offers no handle resistance until the correct code is entered.